James Anderson is a Visiting Fulbright Fellow in Canadian-American relations at the Centre for International and Defence Policy (CIDP). He is concurrently working on a M.A. in Political Studies at Queen’s University. His research interests include US foreign policy, power transition theory, Canada-US and Canada-China relations. Against the backdrop of a rising China, James seeks to examine whether a historical inquiry of the formative processes of US-Canada relations can inform the future of Canada-China relations in the event that China supplants the US as the world’s ranking power. His keen interests in political-military affairs and veteran affairs led to past fellowships with the Washington, D.C. chapter Truman Project’s Defense Council (2018) and the Veterans in Global Leadership (2017). 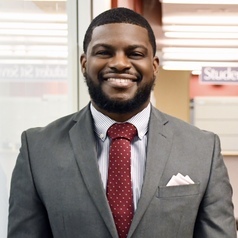 Furthermore, James was listed on the 2016 South Carolina Black Pages Top 20 Under 40 list for his role in uniting and empowering veteran graduates for advocacy in local and national initiatives at his alma mater. James holds a M.A. in International Relations from American University and B.A. in Political Science from the University of South Carolina.